After the launch of the U.S. Soccer Girls' Development Academy was highlighted by a Concussion Awareness Week kickoff event between Sky Blue - PDA and FC Virginia U-16/17 on September 2, 2017, the inaugural regular season for the program has come to an exciting conclusion. This weekend, June 9-10, marks the final weekend of regular season fixtures on the Girls' side, with playoff implications on the line. While the buildup to Academy's largest postseason event in history, the 2018 Summer Showcase and Playoffs, has already been ignited by the announcement of group pairings for the Boys' playoff age groups, the final weekend of Girls' play will lock in all remaining playoff spots. Academy postseason play on the Girls' side at U-15 and U-16/17 consists of 32 teams entering a draw. The U-18/19 age group's 16 best teams will play in a 4-group, playoff structure that will crown a champion in Oceanside. 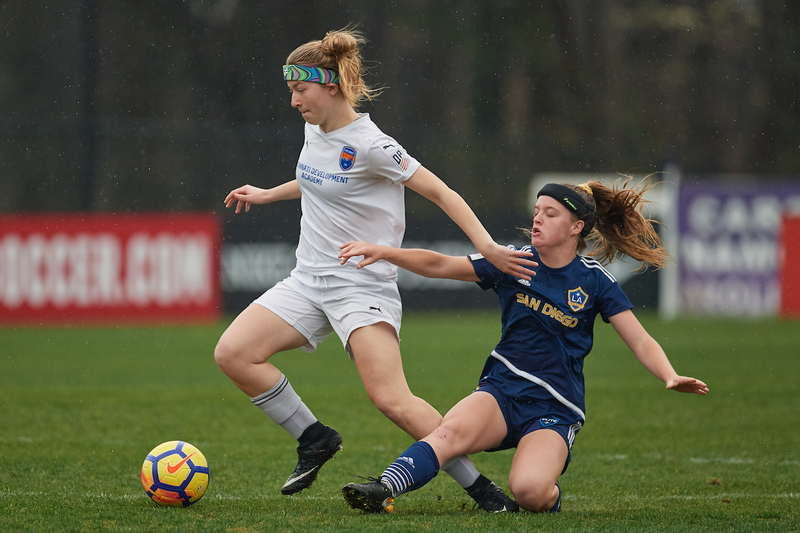 Like the Boys' Academy Playoffs, the Girls' U-15 and U-16/17 age groups will see the top three teams in each division enter the playoffs as automatic qualifiers, joined by 11 wild card teams which are based on points per game average (PPG). The 32 teams are then segmented into four pots, based on final seeding, via PPG. The top eight teams enter pot one, 9-16 make up pot two, 17-24 form pot three and 25-32 shape out pot four. Next, one team per pot is drawn into each of the eight groups (A-H). The only exception is that no team can be matched up in a playoff group with another team from the same division. The matchups from this year's Girls' Development Academy Draw are expected to be announced on Thursday, June 14. While the Girls' U-18/19 competition will begin and end in Oceanside, the semifinalists from the other four competitions (Boys U-16/17 and U-18/19, Girls U-15 and U-16/17) will travel to the U.S. Soccer National Development Center and Swope Soccer Village for the Academy Championships, July 8-11. Ultimately, the goal teams in playoff contention from both Girls' U-15 and U-16/17 age groups is to finish in playoff position to secure their trip to San Diego and give themselves a chance at winning their group, advancing to the knockout round quarterfinal and punching a ticket to Kansas City. Because clubs from different regions play a slightly different number of games throughout the regular season, the final seeding of teams before each playoff draw is based on PPG. Entering the final weekend of Girls' Development Academy play, below is the final table of the top 32 teams, plus the first few teams outside of the top 32, including Charlotte Soccer Academy (U-16/17) and Cincinnati Development Academy (U-18/19), who still have an opportunity to crack the top 32, pending results this weekend. While the final standings are not complete until every single game is played and properly recorded, 31 teams have officially locked themselves into the playoffs. Those 31 teams playing this weekend will be looking to improve their final PPG in order to potentially move up to a higher pot. Official Academy standings can be found here. Michigan Hawks (U-16/17) and Cincinnati Development Academy (U-15) are the two teams to keep an eye out for this weekend. On Sunday, Michigan travels to take on Eclipse Select Soccer Club. With a win or tie, the Hawks would remain in the top 32. With a loss, Charlotte Soccer Academy would jump into the top 32, and Michigan would fall out. On both days of the weekend, Cincinnati Development Academy plays the biggest double header of its season. If the squad can manage a win against FC United Soccer Club Saturday and Sockers FC Sunday, they would catapult themselves into the playoffs and bump FC Fury NY out of the post-season.